It has been one heck of a year for our family with a lot of random hiccups along the way. With the sun finally shining and the calendar starting to stabilize a bit more we knew we needed to take a bit of a gamble with the planner and run away for some family time. 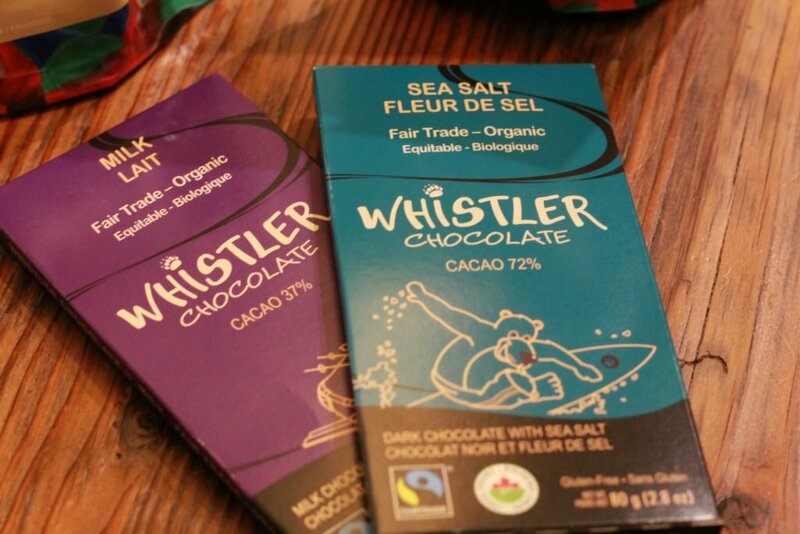 We were invited up to Whistler by the Whistler Vacation Club and I have to say, I don’t think I have ever said yes to an invite as quickly as I did! I felt like this was definitely the universe aligning for us, we needed some time away as a family and suddenly – there it was! Living in Metro Vancouver definitely has its perks, we have oceans at our fingertips, so many wonderful lakes and of course – the mountains. Whistler is just under 2 hours away from our house and a straight shot up a beautifully scenic highway with lots to see along the drive. With just over a weeks notice we cleared some last minute conflicts and got ready for a family trip! Alivia was super excited about getting to stay in a “hotel” again and we lucked out that the weekend we were heading up was the final few days of the Ski and Snowboard Festival in the Village so there was plenty to do! 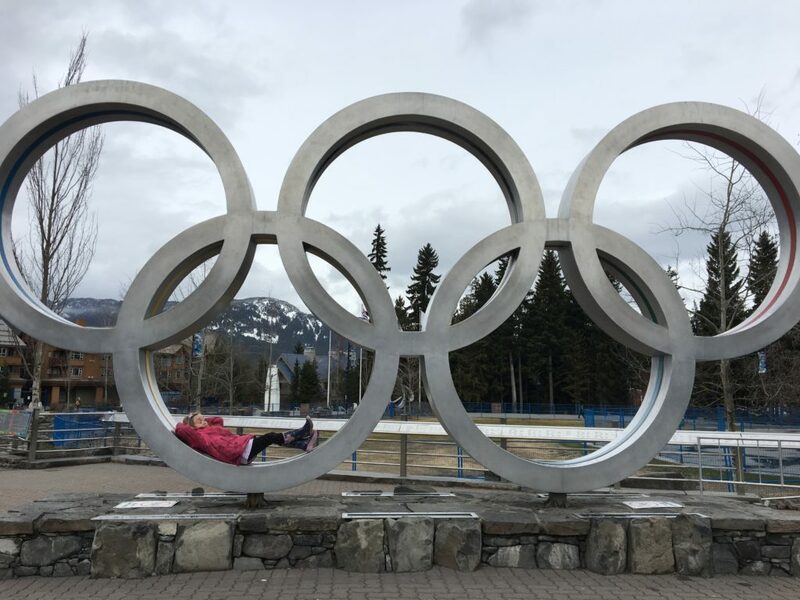 While there is plenty of hotels to stay at in Whistler, we were excited to see how the Whistler Vacation Club differed from a typical stay in the village. We stayed at the Twin Peaks Resort which is a short (very short, even with little legs!) walk from the village. 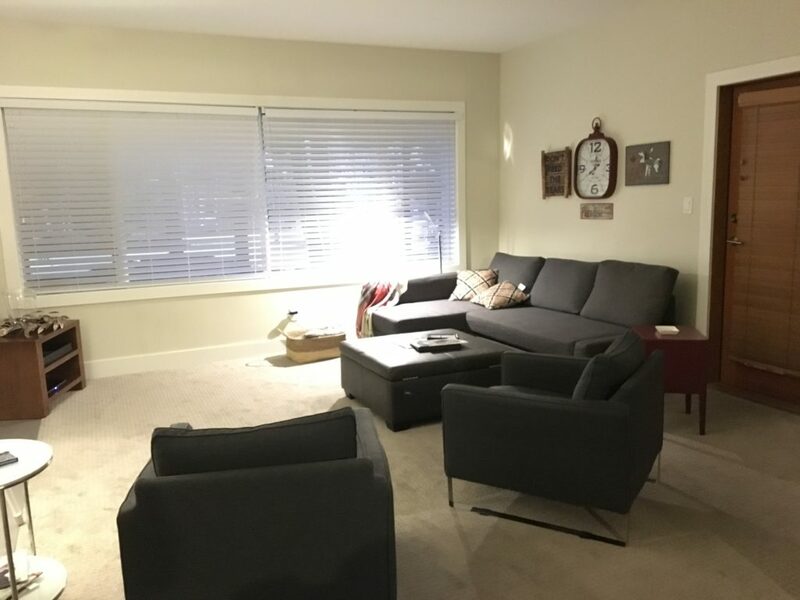 With a few convenience stores located across the street including a grocery store and a Tim Hortons, it’s a perfect location for families as it’s a bit quieter. We drove up on Friday night and check in was a breeze at the front desk. I really appreciated the free wifi and coupons for local attractions that were included. We also got a quick glimpse of the pool and hot tub and Alivia was super excited to check them out the next day! We’ve stayed at a few hotels as a family and while there was nothing to really “complain” about per-say, there was definitely things I wished that we had when it came down to staying as a family. I honestly had no idea what to expect about our room at Twin Peaks, but our host – Roberta, re-assured us that it was her “favourite!” room and had just been renovated. I wish I could explain the look on our faces when we walked in the door. Pure.Shock. Twin Peaks Resort sets itself way ahead of any hotel I’ve ever stayed at. We walked into a CONDO. 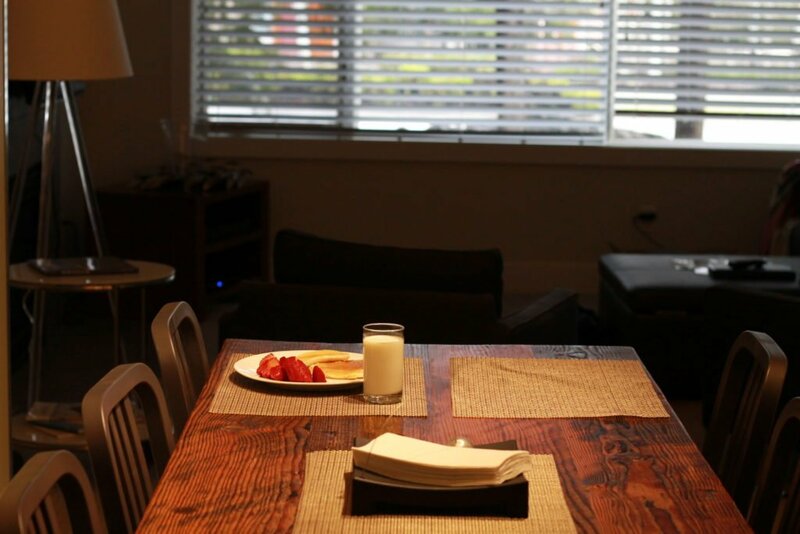 It was amazing with just the right amount of comforts to feel homey. 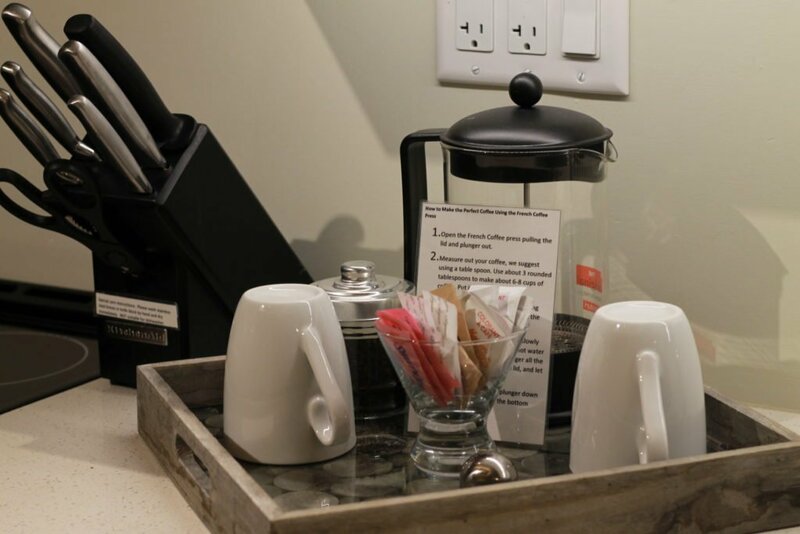 Each unit at Twin Peaks Resort includes laundry facilities, cable/satellite TV, a fireplace, bathrobes, dishwasher, microwave, linens and towels, coffee maker, toaster and basically everything else you could possibly think of to make your stay comfortable. We literally found everything we needed! 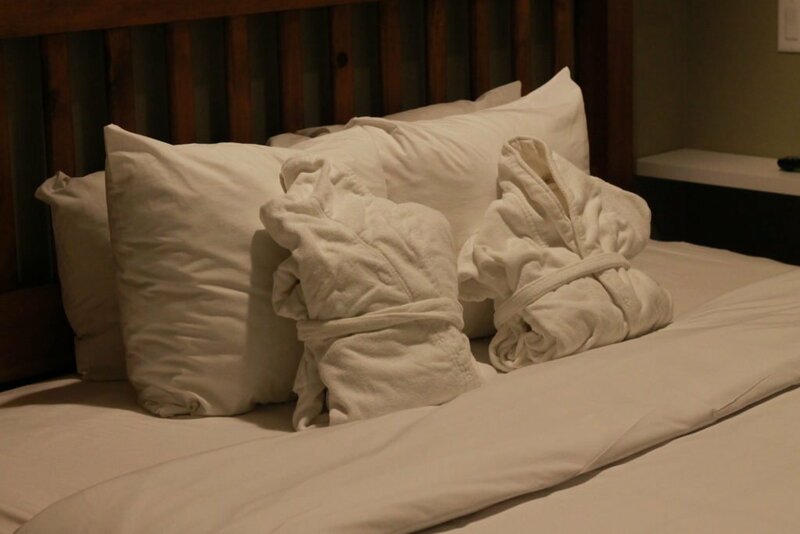 We stayed in one of their two bedrooms, two bathroom suites that comfortably sleeps six, though there is also 1 bedroom suites that comfortably sleep 4 offered as well. 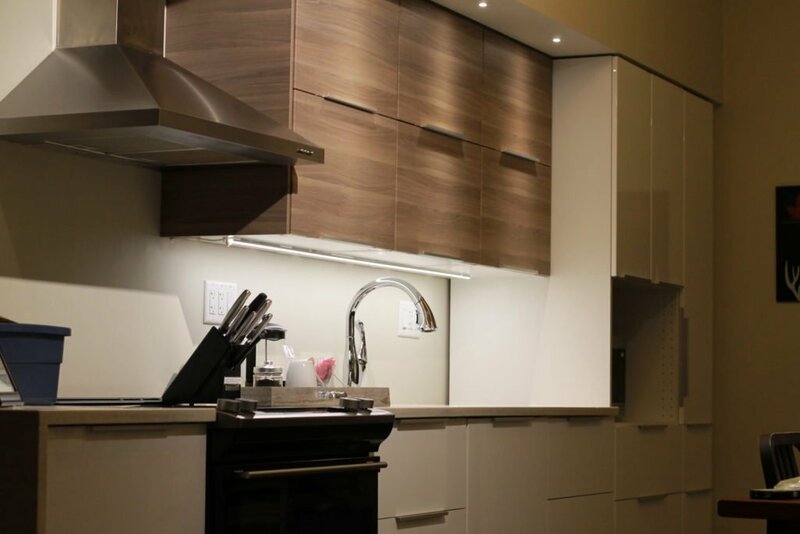 With a full kitchen with full-size appliances and every item you could possibly need on hand to feed the masses, it’s an incredible way to enjoy a vacation and save a bit of money on eating out. The cupboards were even stocked with coffee, tea, and hot chocolate packets! I joked with Ry the entire trip that they would have to kick me out at the end of our stay, the heated floors in the bathroom, under cabinet lighting throughout, two balconies to enjoy the hustle and bustle on the main street and every small little detail to make our stay comfortable really made me wish we were staying longer! I usually feel claustrophobic in hotels after a night, but nothing felt small about this stay. Something that truly stood out to me is how eco-friendly and green the resort is. Unlike hotels where you throw everything into the trash and the cleaning services comes and collects it daily. The resort provides patrons with a greens bin, a recycling bin, and a trash can as well as instructions on what can go into each. At the end of your stay, they request that you take your bins downstairs with you to empty them when you check-out. Though a bit less “full-service” than a big hotel chain, I really enjoyed that I was reminded to be conscious of the earth and a bit more hands on. We had a lot planned for the following day in Whistler so an early bedtime was a must. 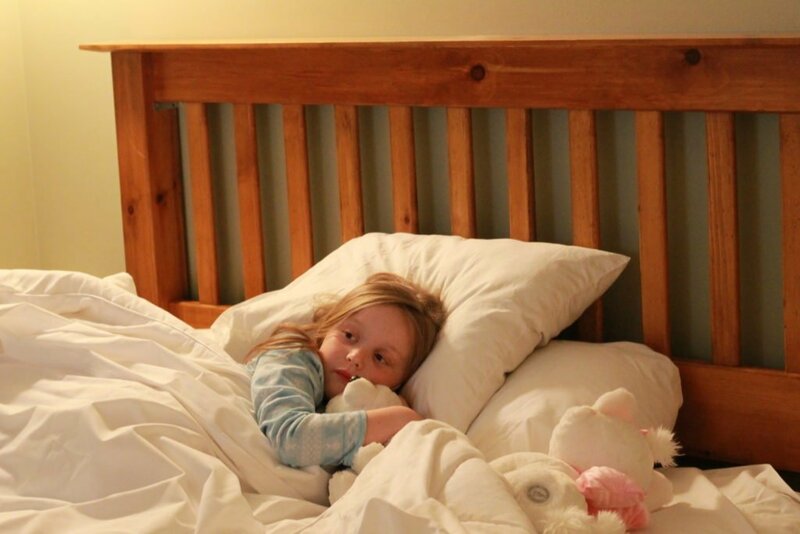 Alivia enjoyed having her own TV in her bedroom and dad and I enjoyed that we could watch a movie in the living room or head to bed at our own leisure without worrying about waking up the little dragon. 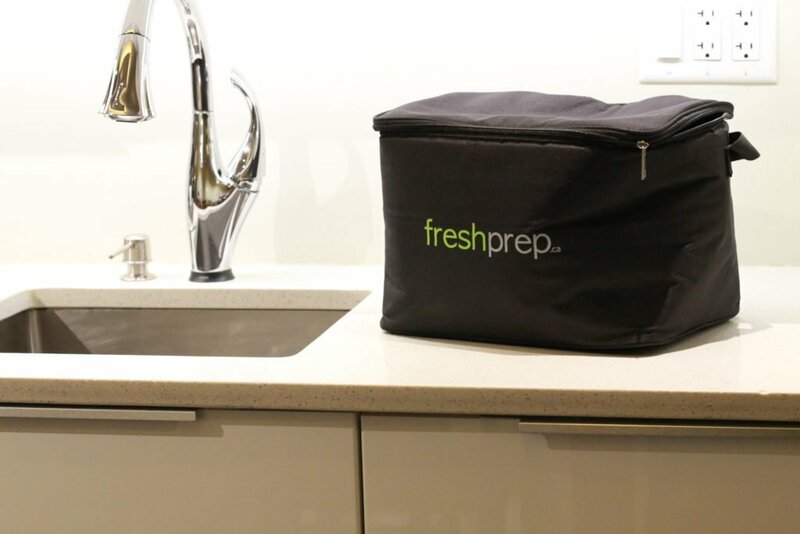 Though we had plans to eat out for a few meals while we were in the village, we also packed dinner for our first night (ala Fresh Prep, which is amazing for on-the-go vacation dinner ideas!) and packed some of Alivia’s favourites for a lazy breakfast. Her dad had gotten up super early to hit the first chair on Whistler and that left us to enjoy a full day in the village on our own. We were super lucky to hit the end of the season, with high temps but snow-covered mountains it really was an amazing day to wander for some mom & daughter time. Mid-morning dad checked in with us and his initial message to me was just “Wow”. 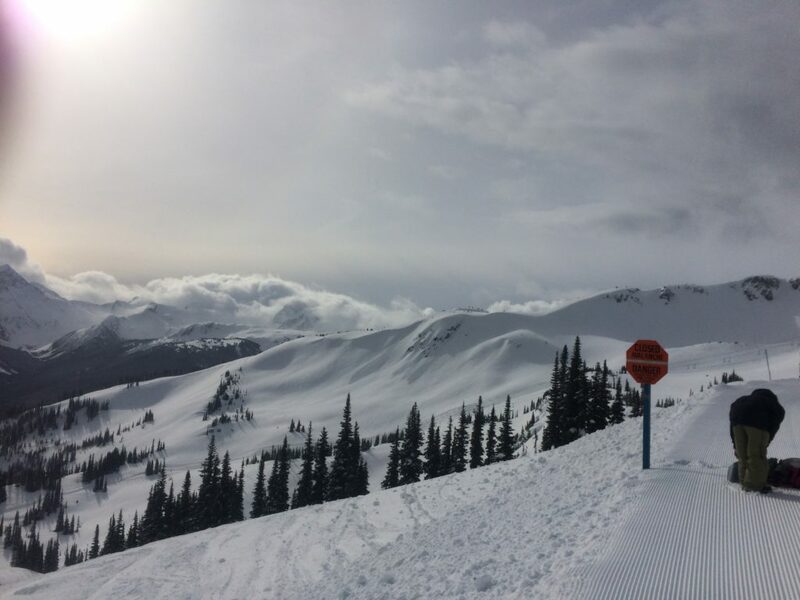 We’re very familiar with Grouse and Cypress Mountain for snowboarding (and they are a wonderful option for close to home) – but Whistler Blackcomb is a whole different league. 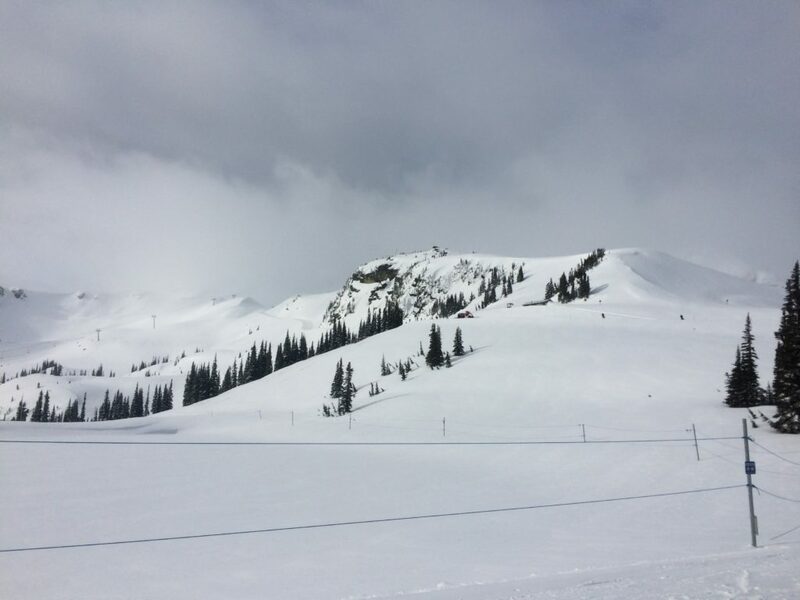 Ryan is a very seasoned snowboarder and will usually go 2-3 times a week with his annual pass and even he was blown away by the sheer volume of runs, the diversity of levels available for seasoned and beginners and how well maintained the runs were. I honestly didn’t think he was ever going to come OFF the mountain! It was pretty clear in that moment why so many tourists fly from all over the world to get on these runs. We asked on our Facebook page what we should do on our free day and you guys did not disappoint! We had so many suggestions for food options, shops to check out that Alivia would like and souvenirs to grab. Even though we live so close to Whistler it’s not close enough for us to go up THAT often so there were some new things to check out! 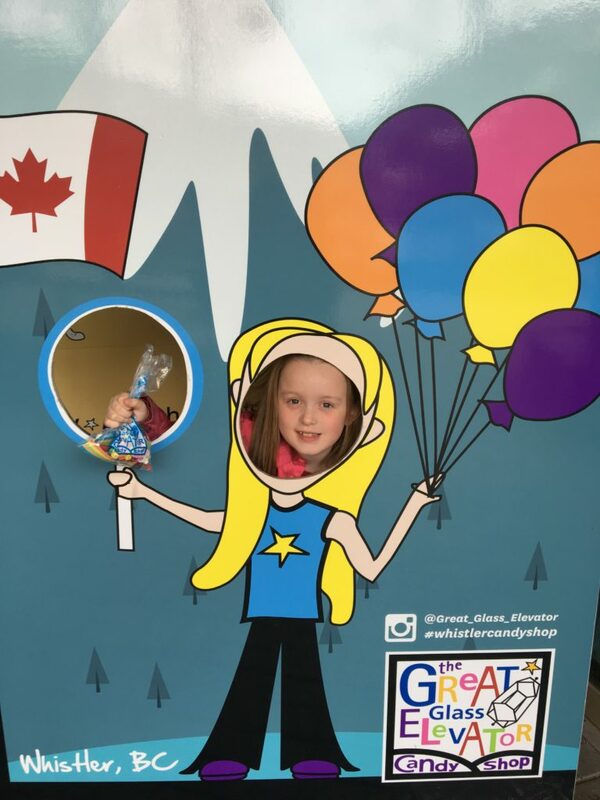 When we started exploring I knew I was just going to let Alivia lead the way, with the Ski & Snowboard festival in full swing there was a ton of neat booths she stopped at to grab some swag, she made herself a Swatch+ toque, picked up a beanie and some snacks from Clif and went on her way! Our first stop was the Rocks & Gems Canada store, located centrally in the village this store is one that Alivia physically dragged me into. She loves collecting different rocks on our adventures and she easily spent 20 minutes wandering through exploring, she chose a small pile of rocks from inside the bulk bin and the staff spent a bit of time explaining to her what each rock was, and gave her a super special angel one. 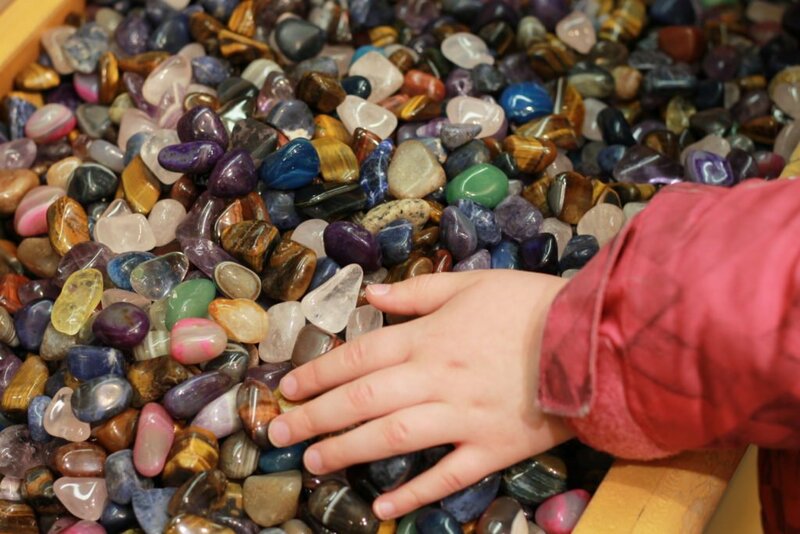 She remembers where each rock she finds is from so she loved added a few special ones to her collection and picked some of her favourite colored ones. The store is kid friendly and the staff was amazing at answering any questions we had. Though there are a ton of little candy shops and places to pop in for a sweet treat including Cows Ice Cream shop and the Great Glass Elevator Candy Shop – The Great Glass Elevator Candy Shop came so highly recommended by you guys that we knew this would be a place we’d stop! 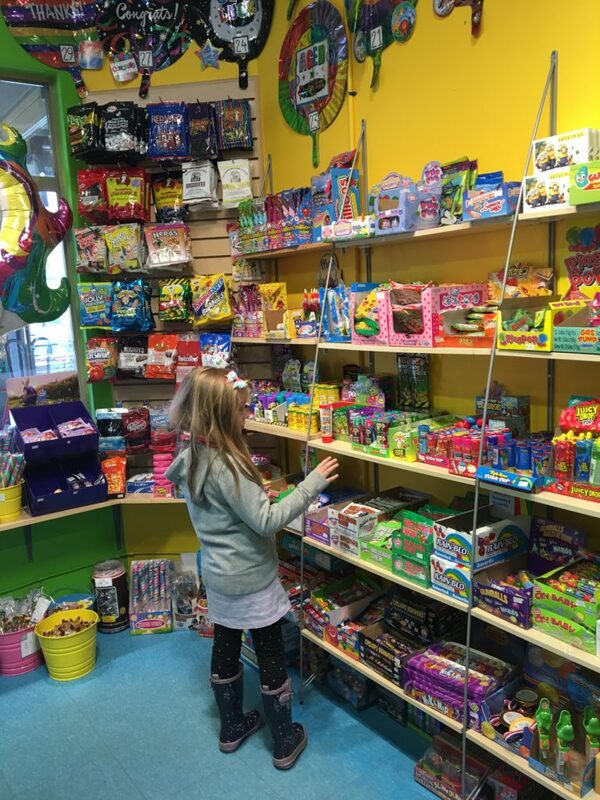 Whether you are a fan of the nostalgic candies from your own childhood or have a craving for something from back home, there is literally a treat for everyone in this store including one of the most amazing bulk sections we’ve ever seen! You could very easily eat your way through Whistler Village on just quick meals, there’s tons of little sandwich shops, bakeries, pizza joints and more. We stopped and had a quick slice of pizza before making our way through the Olympic Oval – pretty much tourist central. If you’re visiting up there, you have to get a photo in front of the rings! There is a couple spots to grab a shot like this so make sure to stop and take a peek when you’re there. Once we had snacked our way through many treats and checked out a few of our favourite shops (you can always find me in Roots if there is one, FYI) it was time for me to sit down and enjoy a cup of coffee and let the little one burn off some sugar. Right next to the rings is one of the most amazing, inclusive playgrounds I’ve ever seen and I wish I could properly explain how amazing it is – I wasn’t comfortable taking a lot of photos as it was PACKED with kids they day we went, but there is everything from spinners, climbing toys, a treehouse, slides, walk in boats and lots of comfortable places for a caregiver to sit and still have a birds eye view on the littles. We spent a ton of time here. Once dad finally came off the mountain later in the afternoon we were all starving! 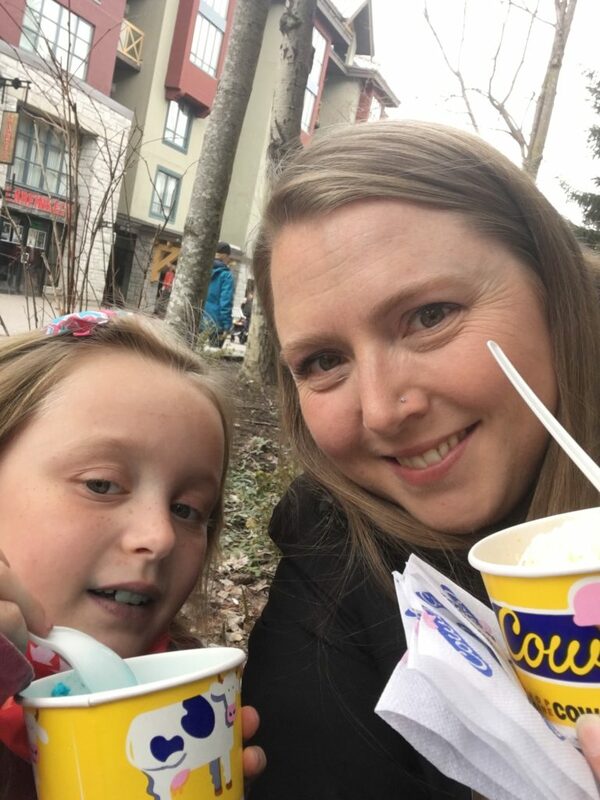 Thankfully, Roberta had been amazing at suggesting a ton of different options that were family friendly in the village prior to our trip, just one of the many ways the Whistler Vacation Club goes above and beyond – and we ended up trying a place we might have otherwise passed over. 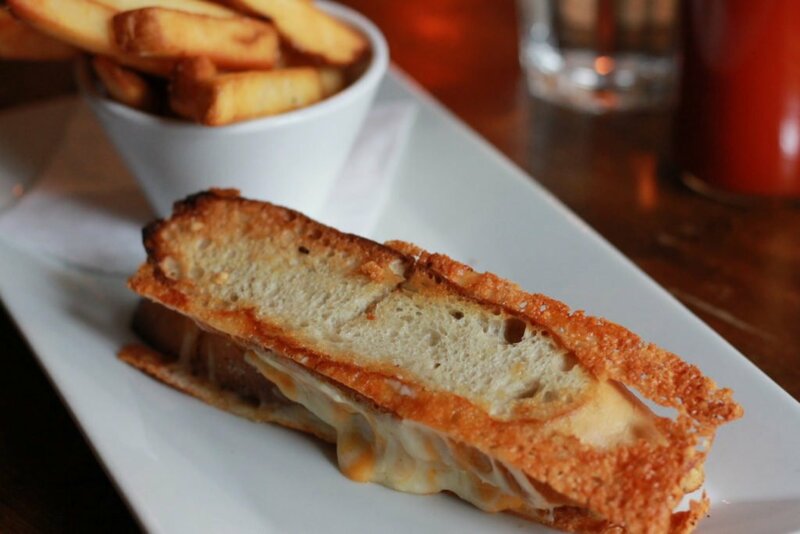 We don’t usually go for pub food with Alivia, as the environment isn’t always “kid-friendly”, so when Roberta suggested the Brickworks Public House I did a quick scour through their website and called to confirm they even had a kids menu. The staff was super friendly and assured us they could make something off menu (ala, grilled cheese) and kids were definitely welcome. If you’ve been following our blog for awhile, you know that music runs in Alivia’s blood. She is mesmerized by sound, instruments and live performances and we lucked out that on our Saturday night trip to Brickworks, there was live incredible music with some songs that even Alivia knew and was singing along with. Though a bit louder than I would recommend for the super small crowd, she loved it! We decided to go a bit crazy with this dinner and ordered what would arguably be the *best!!! * appetizer we’ve ever had. 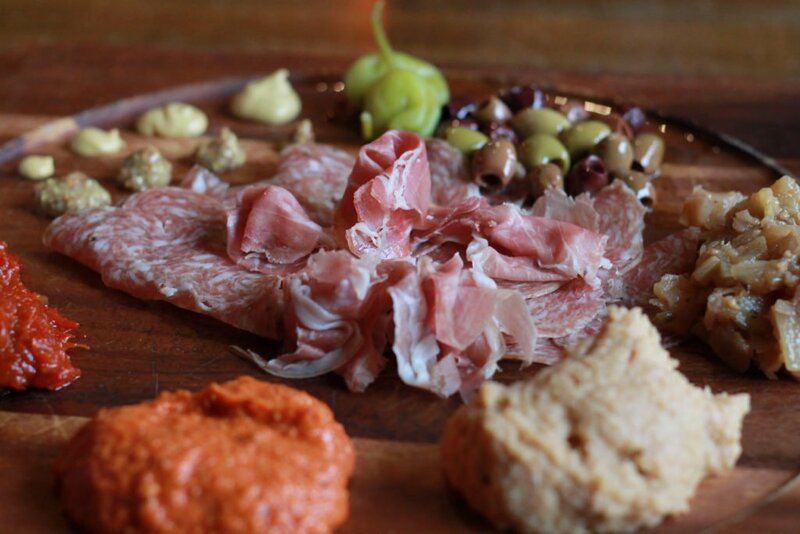 The Mezze Platter was the perfect mix of modern gastro-pub food with the comforts of old classics. The seasonal spreads were a delicious mix of hummus, chutneys, jams, cured meats and olives paired with a huge spread of crustinis and pitas. When this spread arrived, I almost regretted ordering dinner. Almost being the main word here. While Alivia happily devoured her grilled cheese and grooved to the live music, Ryan and I’s eyes widened at our main course. Ry ordered THE Burger, which was a beast in itself but boasted the perfect mix of flavours, and when paired with any of the craft beers offered on tap it is comfort food personified! I wasn’t feeling a burger and ended up ordering the Beer Pan Chicken which came with the most mouth watering potato pave (yea, I had to ask what that was too!) 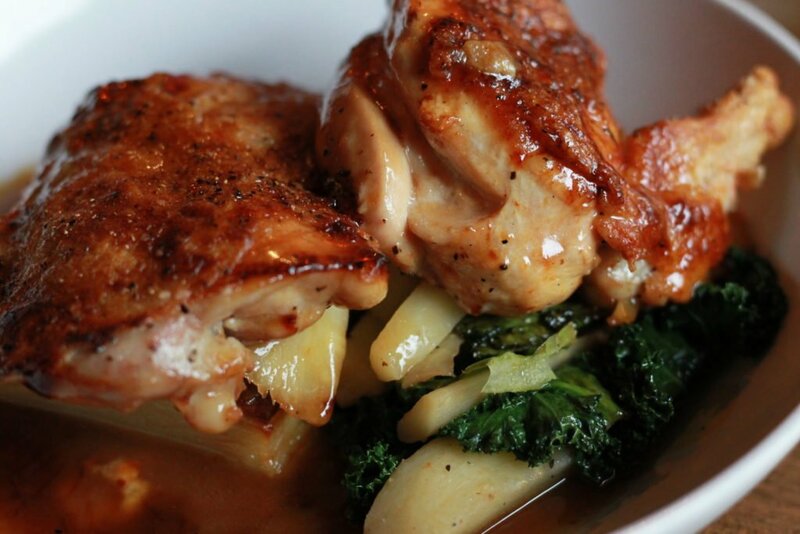 and topped with a wheat ale gravy. The chicken was beyond moist, and eat bite reminded me of Sunday dinners. I was in heaven! 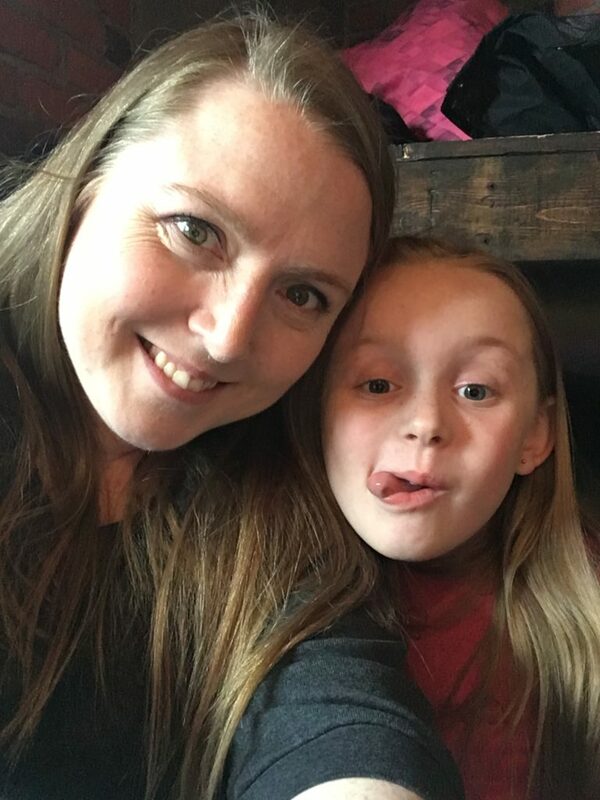 We spent way more time in Brickworks than we normally would have just enjoying our time together and chatting with the manager Paige about the history of the location. As you know, we love to support locally owned businesses so we loved hearing that Brickworks is owned by a local family that actually started in Whistler as tourists themselves and grew to love the village so much they now call it home. With a team who prides themselves on also supporting local businesses, it was so easy to want to support them as well. 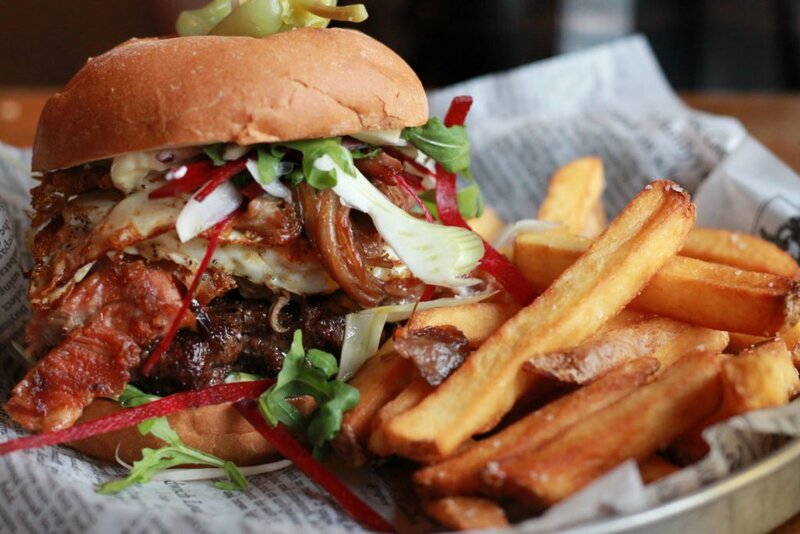 From locally sourced ingredients and local beers on tap, there’s something on the menu for everyone – so come hungry! After our bellies were sufficiently full and the music had died down we headed out for a family walk back to the resort, Alivia took this a chance to show her dad all the shops she had visited and which ones were her favourite and they made a list of things they plan to do on our next trip up – hopefully at the start of the next snowboard season! 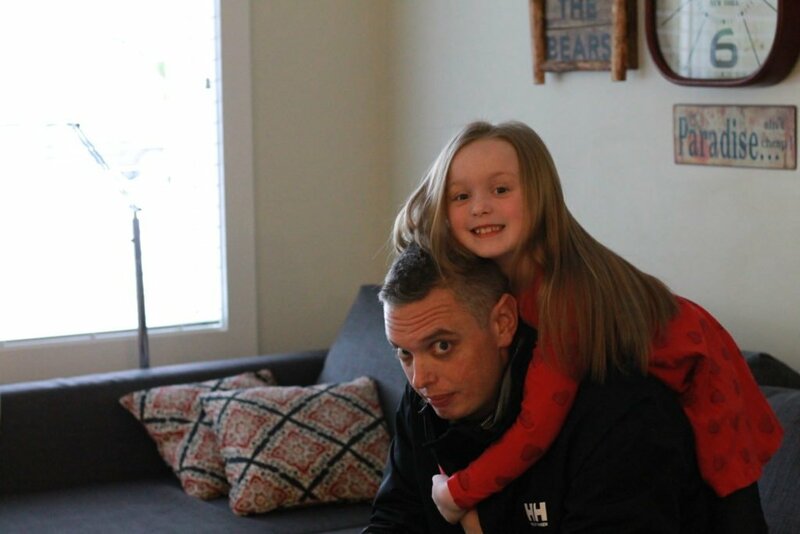 Alivia wants to go up with her dad for some runs, we all want to check out the Ziptrek Eco-Tours, and I’m hoping to squeeze in a kid-friendly visit to the Scandinave Spa. Whether you’re visiting Whistler during ski and snowboard season, or off to enjoy some warmer weather activities, there is a bucket list full of things to do once you’re up there for all ages. 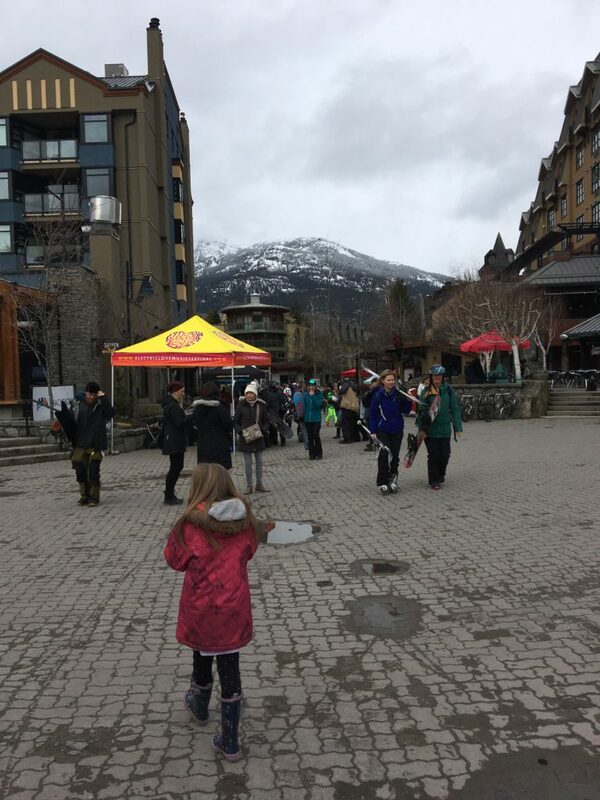 With dozens of food options, places to get your souvenir and gear shop on as well as immerse yourself in live music and pub grub Whistler is one of our favourite weekend staycation ideas – for the entire family. Full disclosure here, I’ve known Roberta for a few years, I’ve always trust her opinion and have secretly longed to get to check out the resorts she works for. When she offered us the chance to go up for the weekend there was no question in my mind! I’ve heard nothing but amazing things about the resorts and we were not disappointed. There’s no way I’d offer a special offer code for a place we didn’t enjoy – we’re sharing it in hopes you’ll use this as an opportunity to get away and enjoy a family weekend away when you need it as well! We don’t receive anything in exchange for you using the code – this one is all for you! The Whistler Vacation Club has generously offered our readers a 15% discount* off their rooms until December 1st, 2018. Whether you’re planning some summer adventures or plan to hit up some early snow, this is the perfect chance to take that family vacay! Right now there’s some of the lowest prices available + a discount = win. * = discount applies to nightly room rate, security deposit is still required and parking is an additional fee. 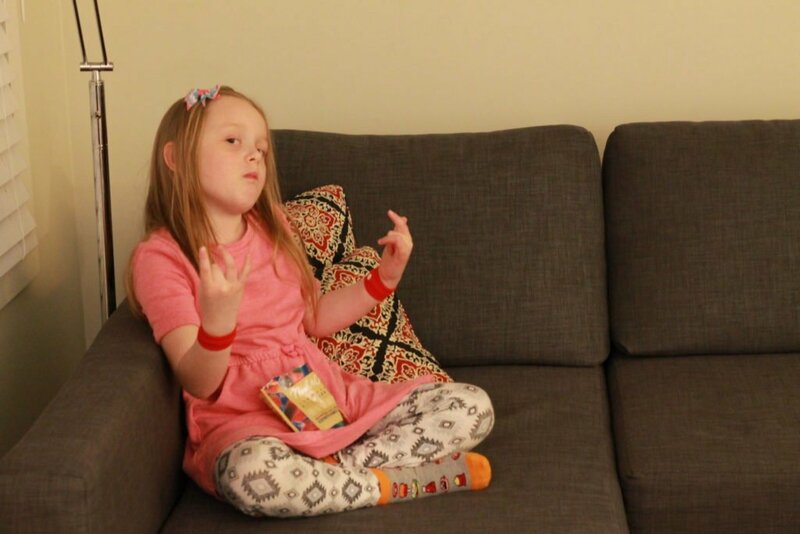 The little zen machine who quite enjoys relaxing with her gummy candies is already asking us when we’ll be going back…. Winter 2018/2019 here we come! Wow, looks like a fun filled time you guys had! Definitely a vacation I need to plan to take the kids on! 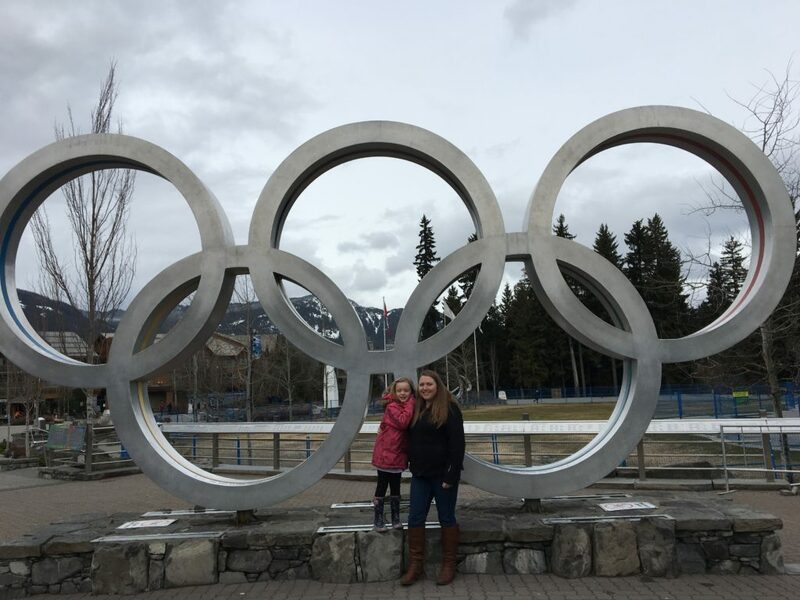 Love Whistler for Family trips! Looks awesome! I need to take my kids there (or myself since I haven’t been since I was a kid). It has been many years since I visited BC.I remember the beautiful flowers. 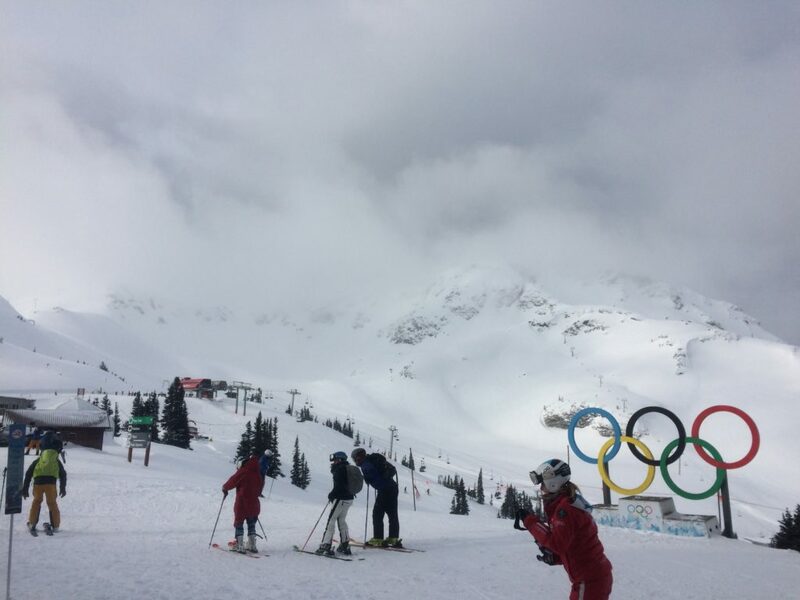 Whistler is our list for a family trip this winter. Great Post!!!! !